This is the much-anticipated third book in Seerey-Lester's "Legends" series. The Legendary Hunts of Theodore Roosevelt features over sixty chapters devoted to TR's most spectacular hunts on three continents. In this book, acclaimed wildlife artist John Seerey-Lester takes you on a historic journey to some of the most interesting wild places on earth. So vivid are Seerey-Lester's paintings and writing that you will feel as though you are there sharing the exciting adventures with the former President. 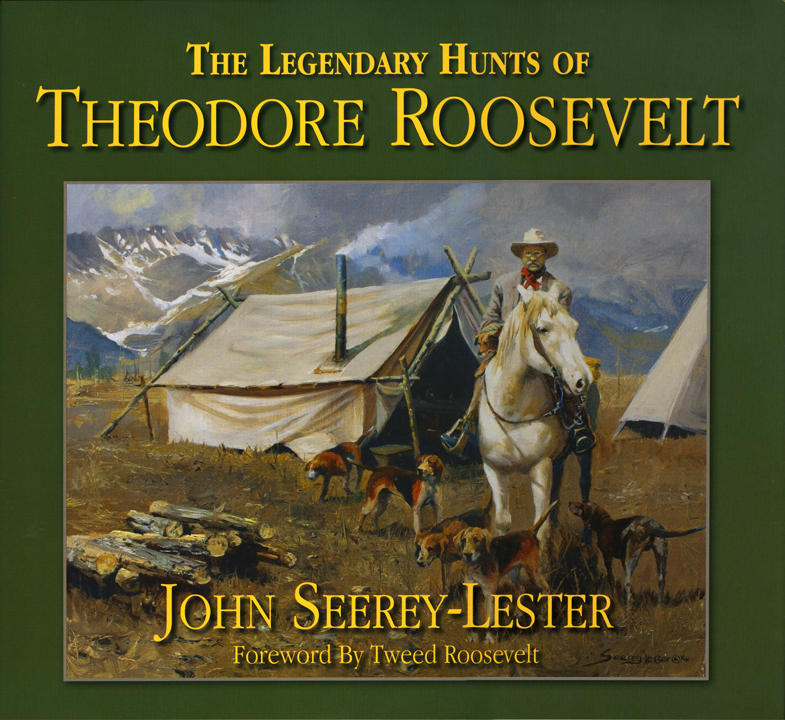 Theodore Roosevelt was a major character in Seerey-Lester's two previous books: Legends of the Hunt and Campfire Tales, but for this book, the artist-author has delved deeper into TR's many sporting adventures and uncovered some little-known stories about his life as a rancher, hunter, explorer, and conservationist. Complementing Seerey-Lester's meticulously researched text are some 150 paintings and sketches that provide a unique glimpse into the life of the former President and his passion for wildlife and adventure. The book covers TR's most active years as an outdoorsman-from the 1870s until his death in 1919. Share in TR's excitement and frustration as a rancher in the Badlands of the Dakotas; hunt grizzlies with TR as he stalks Ursus horribilis outfitted in traditional buckskin and moccasins; and experience several harrowing incidents that set the stage for TR's illustrious life as one of the world's foremost adventurers. Travel with TR and his son Kermit as they lift the veil off the Dark Continent during their memorable safari through British East and Central Africa in 1909. Share TR's discomfort in the freezing cold while hunting in the Bitterroot Mountains where he killed a cougar . . . by hand. Go along on TR's last great adventure into the Brazilian rainforest and down the River of Doubt. There, you will witness an unbelievable series of hardships involving disease, a drowning, and even a murder-episodes that brought the President to the brink of suicide. Finally, relive the hunting and exploratory expeditions conducted by TR's sons in the Far East. "Seerey-Lester has an extraordinary ability to bring to life the high drama of the hunt. TR, of course could supply him with an almost unending series of opportunities to display his artistry. "Seerey-Lester has chosen several of TRs hunts, some lesser known than others. Naturally, his African safari is here. The climax of a lion hunt provides the requisite drama, and the author tells the story well." Join the talented artist and writer to discover the fascinating life and exciting adventures of one of the most impressive men in America's history. Submit your review for "The Legendary Hunts of Theodore Roosevelt"